The definitive account of how America's War on Terror sparked a decade-long assault on the rule of law, weakening our courts and our Constitution in the name of national security. The day after September 11, President Bush tasked the Attorney General with preventing another terrorist attack on the United States. From that day forward, the Bush administration turned to the Department of Justice to give its imprimatur to activities that had previously been unthinkable-from the NSA's spying on US citizens to indefinite detention to torture. Many of these activities were secretly authorized, others done in the light of day. When President Obama took office, many observers expected a reversal of these encroachments upon civil liberties and justice, but the new administration found the rogue policies to be deeply entrenched, and, at times, worth preserving. Obama ramped up targeted killings, held fast to aggressive surveillance policies, and fell short on bringing reform to detention and interrogation. How did America veer so far from its founding principles of justice? Rogue Justice connects the dots for the first time-from the Patriot Act to today's military commissions, from terrorism prosecutions to intelligence priorities, from the ACLU's activism to Edward Snowden's revelations. And it poses a stark question: will the American justice system ever recover from the compromises it made for the war on terror? 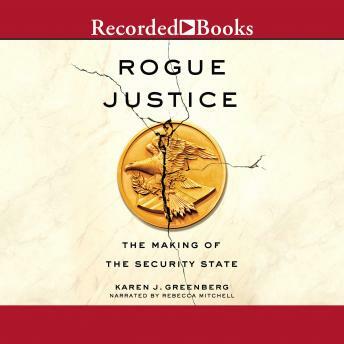 Riveting and deeply reported, Rogue Justice could only have been written by Karen Greenberg, one of this country's top experts on Guantanamo, torture, and terrorism, with a deep knowledge of both the Bush and Obama administrations. Now she brings to life the full story of law and policy after 9/11, introducing us to the key players and events, showing that time and again, when liberty and security have clashed, justice has been the victim.